A recently released report from Transparency Market Research (TMR) forecasts that the global medical polymers market will grow at a CAGR of 8.3% between 2014 and 2020. TMR, a market intelligence firm based in the U.S., states that the global medical polymers market will reach a value of US$17.13 billion by 2020, from US$9.80 billion in 2013. The report, titled ‘Medical Polymers Market - Global Industry Analysis, Size, Share, Growth, Trends and Forecast, 2014 - 2020’, is available for sale on the company website. According to this market research report, factors such as rising consumer awareness, developments in the area of polymer science, and a rapidly growing global population play a key role in the growth of the global medical polymers market. The demand for medical polymers has been on the rise owing to their widespread application as substitutes for glass and metal in the production of medical equipment and devices. With the passage of time, the demand for medical polymers is anticipated to increase. Greater preference for home healthcare treatments and a growing geriatric population also boosts the demand for medical polymers. The TMR report segments the global medical polymers market on the basis of product types, application, and geography. Biodegradable plastics, medical elastomers, and fibers and resins are the key types of products that dominate the global medical polymers market. In 2013, the segment of fibers and resins held the largest share in the overall market. The biodegradable plastics market is expected to grow robustly during the forecast period. The demand for biocompatible materials is likely to gain momentum in the forthcoming years owing to their increasing applicability in implants. Application-wise, the global medical polymers market is categorized into medical packaging, medical devices and equipment, and others. 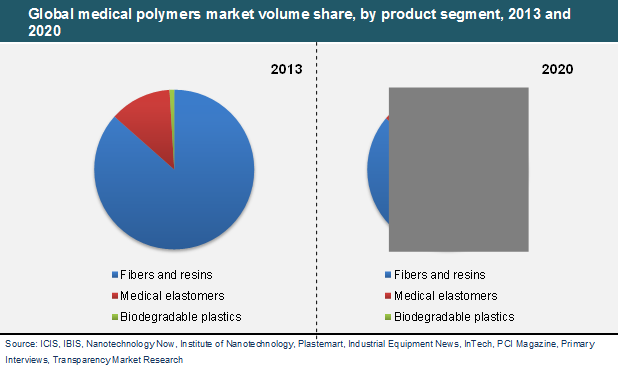 With a share of more than 40%, North America was the largest player in the medical polymers market in 2013. Europe holds the second highest share of this market after North America. Ongoing trends, however, indicate that Asia Pacific will witness rapid growth in demand for medical polymers in the forthcoming years. Some of the factors that will stimulate the demand for medical polymers in the Asia Pacific market are high demand in China and India owing to stringent regulations of the healthcare product market. This research report lays emphasis on the growing popularity of biodegradable components in medical implants, which can prove to be beneficial for market players operating in the global medical polymers market. However, fluctuating input prices and stringent regulatory measures put in place by several governments act as glaring challenges to the global market for medical polymers. Some of the key companies in the global medical polymers market are Celanese Corporation, Eastman Chemical Company, Evonik Industries AG, The Dow Chemical Company, Formosa Plastics Corporation USA, and Victrex plc.